We have finally released our next Forbidden Lore segment in which we cover the 40k Novel Atlas Infernal by Rob Sanders. Due to the delays in getting this segment recorded we decided to release it as bonus content here on the site! You will be able to download it exclusively here until the end of the week, when we release it on iTunes as well. We also include some information about Celesticon! A gaming convention which is local to our area. This convention runs Labor Day Weekend (The 2-5th of September) and promises to be a lot of fun. There will be Board Games, Card Games, Role Playing Games, and a 40k Tournament as well! If you haven’t signed up yet, do so soon! We apologize for it taking so long to get this to you – we hope you enjoy! WARNING – SPOILERS AHEAD! If you are unfamiliar with our Forbidden Lore segment – keep reading BEFORE YOU LISTEN! We will discuss spoilers for the book in this content. If you have not read the book, and you want to, then DO NOT listen to this! 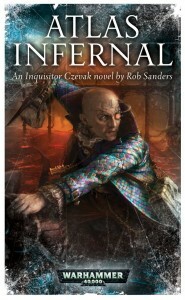 Inquisitor Bronislaw Czevak is a hunted man. Escaping from the Black Library of the eldar, Czevak steals the Atlas Infernal – a living map of the Webway. With this fabled artefact and his supreme intellect, Czevak foils the predations of the Harlequins sent to apprehend him and thwarts his enemies within the Inquisition who want to kill him. Czevak’s deadliest foe, however, is Ahriman – arch-sorcerer of the Thousand Sons. He desires the knowledge within the Black Library, knowledge that can exalt him to godhood, and is willing to destroy the inquisitor to obtain it. A desperate chase that will bend the fabric of reality ensues, where Czevak’s only hope of survival is to outwit the chosen of Tzeentch, Lord of Chaos and Architect of Fate. Failure is unconscionable, the very cost to the Imperium unimaginable. Once per month we pick a “Black Library Book of The Month”. We announce what book it is on one show and we will also then create a thread with a big SPOILER WARNING in the title in our “The Librarium” section of the boards so people can start to discuss thoughts and ideas there. Two episodes later (so roughly one month later), pulling from the thread and our own personal reading experience, we will then have an extremely in-depth discussion about this book. This will cover spoilers about the story, which characters live, die, change, etc. At the beginning of the episode we will announce that we are going to be discussing this book and all the spoilers for it. We will place the segment at the END of the podcast, after the exit music, and present ANOTHER strong warning to really call attention to the fact that spoilers are coming. Then we will have a 20-30 min discussion about the book and what our thoughts were on it. Keep in mind this isn’t a REVIEW of the book – since everyone listening or caring enough to listen to that segment will have already read it. It’s a discussion about what we all collectively read. We really like the Black Library books and we think this will really bring home some of the “Feel like a part of our gaming group” approach we have taken.